Although my skills at defining my brows needs more practice and polishing, that's alright. As long as we're trying then it's all good! Brows as you all know frames the face. I didn't believe it at first but looking at my photos from when I didn't give my brows a second, I was right. Ever since I started having it groomed and threaded, I knew that brows played a big role in giving the face a more polished look. For newbies, it's not really rocket science. Try getting a brow set that has everything you'll need to get glam brows. Like, Benefit Brow Zings. Wax that tames your brows and keep it place. I've been using this for the past week and I think it rocks. It's not the cheapest brow palette out there but it's well-worth your hard earned money if you want to get nice things for yourself. The Trick: Try mixing the wax and color into a creamy consistency and apply it on to your brows. You'll end up with well-defined tamed ones that will make you look fabulous. Defining brows isn't easy but it isn't rocket science either. Like with everything else with makeup, all you need is some practice. So, practice, practice, practice! If you're wondering how you can know what to pluck, try getting your brows groomed first by a professional. Benefit now has a Brow Bar and let them educate you on how to properly clean your brow area. 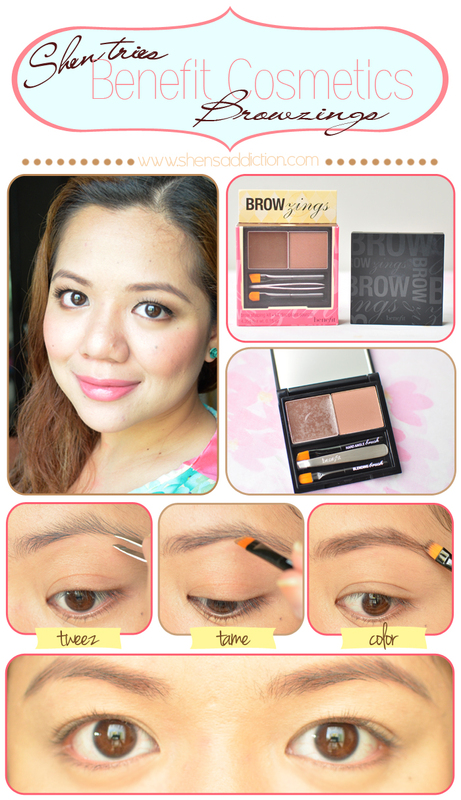 They can also teach you how to shape your brows with Brow Zings palette! Being able to groom your brows on your own is such a small skill to acquire... it's not like curing cancer nor would it pass the RH Bill. But it's a small feat we all can definitely be proud of. Brow Boo-boo? Applied too much powder? No worries! Watch the video below and resolve that too-thick brow application with this effective tip! How's your brows? :) Have you tried Benefit Brow Zings?